WOW! I didn’t realize how long it has been since I posted here. Although very few people read this, I should do better with posting. I apologize and will to do better in the future. So, life has been hectic. I started a new day job 1 1/2 years ago and it was completely crazy. That finally slowed down to a normal pace and then I had to handle youngest child’s high school graduation (YAY! No more high school). My daughter and I are going to Scotland next month with a group of romance readers so the planning for that has been going on in the background of everything else. Also, my daughter and I are working on wedding arrangements for her wedding early next year. Crazy/busy life around here. As for my writing, I’m about 2/3 finished with my rough draft of the current WIP. Hoping to get it finished by the beginning of September. I love the characters and the storyline, hope an agent will too. I’ll leave you with a two-part question. Who is your favorite romance author and why? Hi! I hope everyone had a wonderful holiday season. For me the holidays just finished with the advent of Lent. Mardi Gras, for me, is still part of the holidays since we have parties, parades and lots of food and drinks. And this year with the Super Bowl right smack dab in the middle of it, things were a little crazy in my beloved city. Now it’s time to get serious again. I’ve been doing a lot of writing, plotting, revising, etc and have set some tough goals for myself. I want to attend RWA National Conference this summer but I want to finish my manuscript before I go. My goal is to pitch to some agents at the conference so I want a completed manuscript. It won’t have to be polished, just a rough draft, but I want to see those amazing two words – THE END. Wish me luck and send me all the good vibes you can spare! Did you set any tough goals for yourself recently? Hello! It’s been a crazy life lately but a good one. Started a new day job and it’s going great but taking a lot of time. Still writing but it’s been slow lately. I do have a blurb though. 1st time I’ve done one that I think works. Still needs tweaking and possibly a rewrite or too and it will probably change as I finish the story but here it is, just because I have it. Disowned by her father and shunned from society, a woman alone in eighteenth century England doesn’t have many options, but Lissa Bottomley learned to survive. Using the skills she acquired in finishing school along with the memory of her mother’s miserly ideas, Lissa helps society’s matrons plan elaborate parties and balls without the elaborate bills. Satisfied with her life, if not happy, she lives on the fringes of society, ignoring the snide comments from her employers until a chance encounter at a house party changes everything. James Huntington, newly minted Marquess of Ravenswood, just wanted to be left alone. He barely survived the war and now has to learn to manage properties he never thought to own and arrange a Season for his favorite niece. Love her though he does, he wants to get her married off as soon as her mourning period has ended, so he needs help. While at a house party, he finds the perfect solution. A Lady who can chaperone, arrange a Season and find a suitable spouse for his niece while leaving him out of it. When Lissa moves in with James and Mavis, attempts on her life start happening and soon James has a new war to fight and he learns that being alone can be just as painful as his war injuries. 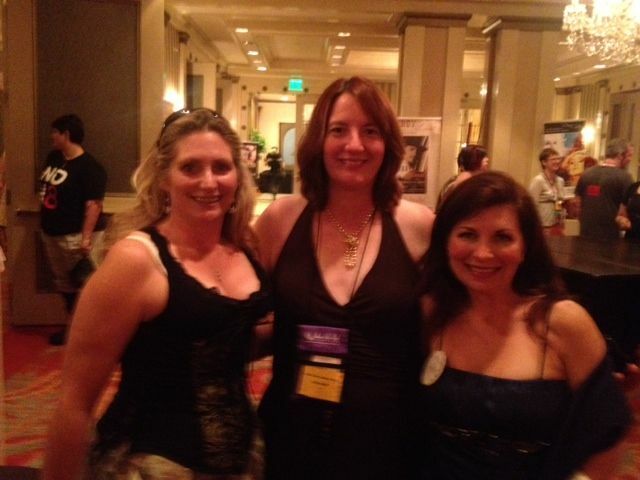 Authors After Dark had their 2012 Summer Camp here in New Orleans and it was great. The author workshops were very informative and I can’t wait to put some of my new knowledge to the test. Just hope some of it works for me. I met some amazing authors and unpublished writers and saw some old friends too. For dinner last night I was able to sit next to Lissa Matthews who was a lot of fun to talk to. Also at our table was another local writer Cristin Storm who I’m sure I will see a lot more of. I also talked with Kristin Painter, Diana Rowland, Pamela Palmer, Jade Lee, Erin McCarthy, Joey Hill, Cat Johnson, ELiza Gayle, Amanda Carlson, Kalypso Masters, Jess Haines, Leanna Renee Heiber, Suzanne Johnson… there were so many great authors that I can’t remember them all. Long weekend but a great one. The Jazz Fest is over and it was a brutal one. Record crowds, record sales, definitely one to remember. The heat was almost unbearable but there was usually a nice breeze blowing. Also our drink booth was featured in the local newspaper’s Living Section. The reporter did a wonderful write up for the non-profit organization that works the booth every year and interviewed people who have been there almost from the beginning. It was a lot of fun though and I can’t wait to work it again next year. So what has kept you busy the last few weeks? 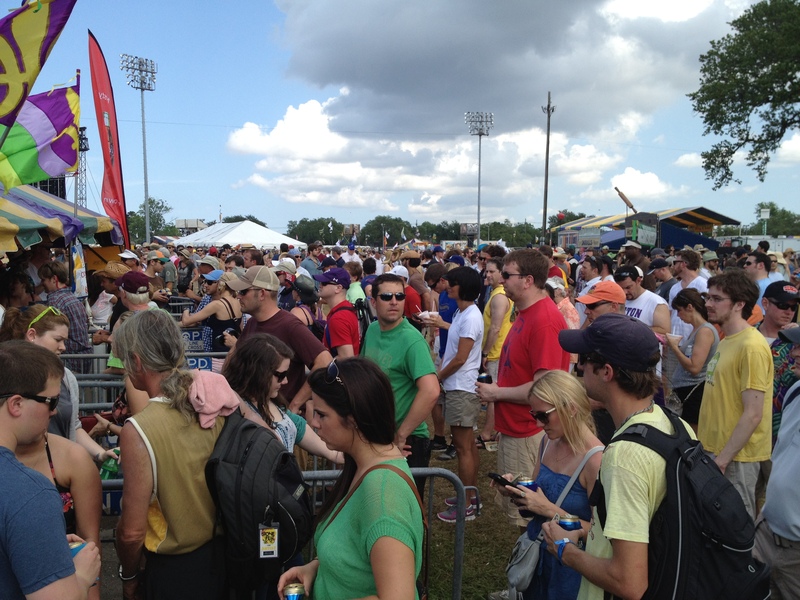 Well, the New Orleans Jazz & Heritage Festival starts tomorrow and goes all weekend. It continues the following Thursday thru Sunday for a total of 7 days. And where will I be for all 7 days, at the Fest of course. A friend and I run a drink booth there to help a non-profit organization raise sorely needed funds. I’ve been working at this booth for over 30 years (yes I was just a babe when I started LOL) but running it for the past 6. It’s a lot of hard work but also a lot of fun. This year the local newspaper is doing a write up on us and our booth so I’ve been talking to the reporter and getting together additional information for her. It’s a little nerve wracking knowing that I’m going to be quoted in the paper for thousands to read. I know, I’m working towards becoming a published writer where many more people have the potential to read my words but with writing, I have time to review what I’ve written and edit it. With this I have to trust the reporter to quote me correctly and hope I don’t give incorrect info. I am looking forward to the weekend and seeing friends that I only see at the Fest. The music is amazing, the food delicious, and the weather promises to be perfect, what more could I ask for? Have you gone to any festivals and if so, what is your favorite? I wanted to post this sooner but damn if something didn’t keep happening that would stop me. Anyway, Fantasy on the Bayou is over and what a great conference it was. I was able to meet some wonderful people in the industry and learn a lot from them. Maggie Mae Gallagher, cub reporter for Barbara Vey’s Beyond Her Book blog, was so much fun! 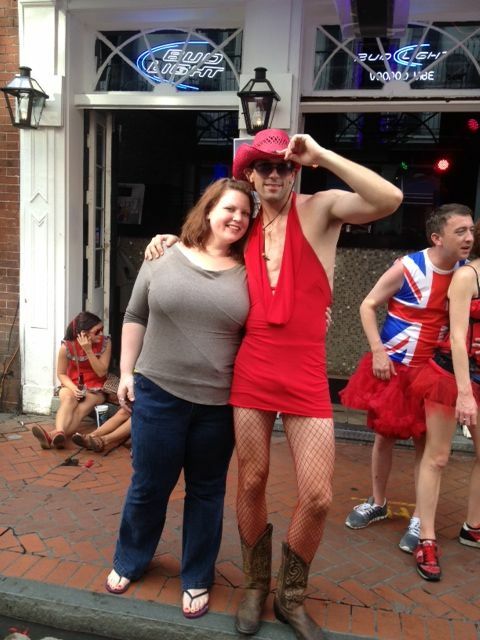 We were able to go out and enjoy the sights on Bourbon Street and she wrote a great report on the conference. I was able to meet and visit with Liz Pelletier of Entangled Publishing and Elaine Spencer with The Knight Agency along with authors Kristen Painter and Kerri Nelson during the Keynote Luncheon. They were all great to talk to and patient with this newbie writer and my questions. They were perfect table mates. I was also able to meet and chat with Maggie Shayne, the Keynote Speaker. Maggie was actually a stand in for the original scheduled speaker, who was not able to attend because of personal reasons, and she did an amazing job. Maggie had everyone laughing at her childhood stories, crying over her hardships, and cheering her on even after she’s become such a well loved author. But Maggie went above and beyond for a few of her fans, myself included. My daughter and her friend were at the book signing event on the last day of the conference, and they told Maggie about a mutual friend, Shannon, who wanted to be there but couldn’t because of work. Since she had some free time before her flight she offered to go visit Shannon at work but since she didn’t work in the French Quarter, it didn’t seem possible. I told Maggie that if she really wanted to do this, I wouldn’t mind bringing her and then I’d take her to the airport. She agreed and was so excited to do this, she made sure to tell us not to say anything so she could surprise her. So after leaving the hotel, we met up with Dawn Chartier, Liz Pelletier, and Leanna Renee Hieber for lunch then headed to the bookstore where Shannon worked. We arrived and went straight to Shannon. When we arrived, Kendall, my daughter’s friend, told her that not only did we bring her a signed Maggie Shayne book, we brought the author herself. At this point Shannon started tearing up and her and Maggie hugged. We had learned that Shannon had lost her grandmother the night before so getting to meet Maggie was even more special. It helped to cheer her some. We all visited with Shannon for a little while then we all sat on the floor with coffee and chatted about books, puppies, whatever we wanted. It was such a special day for all of us there and it wouldn’t have happened without Maggie. So here’s a toast to Maggie Shayne! Thank you for sharing your story with us at the conference and for sharing a part of your day sitting on the floor with us and chatting like teenagers. You gained a couple of new fans I am honored to have been a part of it. May you always be blessed with good friends and close family.